Built-in menus in DevExpress controls display duplicate items after invoking a TreeList control's built-in menu or a tab/page control's Go Dialog. Hot-tracking a popup menu item displaying an icon causes an AV if a bar manager's Style property is set to bmsEnhanced. In-place cxImageComboBox - Activating another cell's editor displays the previously active cell's edit value if the Properties.IncrementalFiltering property is set to True. TcxButton - Assigning a drop-down menu in the OnDropDownMenuPopupEx or OnDropDownMenuPopup event handler doesn't replace the menu specified using the DropDownMenu property. An AV occurs at design time when selecting "Revert to Inherited" in the context menu of a TcxGrid control located within a visually inherited layout control in certain cases. 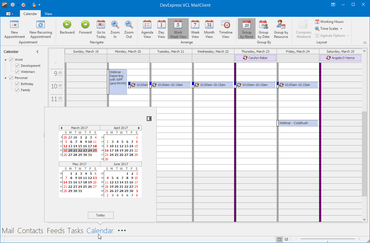 A glyph assigned to a custom menu item is not displayed if the item is within the built-in popup menu of the TcxGrid or TcxScheduler control, provided that the ExpressBars Suite is installed. All DevExpress controls - Changing the content in an image list linked to a DevExpress control does not immediately repaint it. SVG Images - An exception occurs on drawing an image containing the "Text" element with invalid font parameters. The "List index out of bounds (0)" exception occurs on posting data if the SortedField property is specified, the ProgrammedFilter property is set to True, and FilterList is empty. The default fonts are scaled twice when loading any NavBar control positioned on the form designed at 96 DPI if the current system DPI exceeds 96. DB Table and DB Banded Table Views - Collapsing all rows doesn't collapse the group row containing the selected row if it was located more than once. Master-Detail - Expanding all rows consumes a lot of memory. Table and Banded Table Views - The popup menu assigned to the PopupMenu property of the grid control or the grid View is not displayed if the built-in popup menu is empty for a specific View element. The Component Editor dialog flickers on switching between grid Views. The default column widths are incorrectly initialized on creating a form if the current monitor DPI differs from 96. The font specified by the Styles.Content property is not applied to selected cells if the Styles.Selection property is assigned a style whose Font property is not customized. An event caption is incorrectly positioned within a popup hint displayed in Modern Style mode if the monitor DPI differs from 96. Handling the OnGetEventDisplayText event has no effect if the Modern UI Style is selected. The date navigator does not show holiday hints if the Modern UI Style is selected. Ribbon - TdxBarLargeButton whose Down and ButtonStyle properties are set to True and bsCheckedDropDown blends with the background if the Office2013~ skin is applied. A numeric value assigned to a cell via its AsString property is automatically converted into a number. The 'Control has no parent window' exception occurs when trying to change an active sheet while an inplace cell editor is opened. The public GetCellValue procedure has been removed from the TdxSpreadSheetTableView class. The VALUE function does not recognize a numeric value stored as a string if one or more zeros precede the first meaning number.